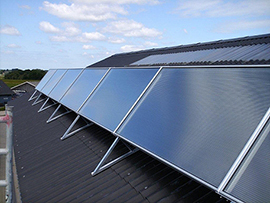 Solar heating enhances air quality in schools - SolarVenti Ltd. Many New Zealand primary-school children struggle through the winter months with respiratory and infectious illnesses. Could improving air quality in classrooms help their health? Frequent winter illnesses cause many primary school-aged children to be absent from school, less able to concentrate on their studies and struggling to achieve—the knock-on effects of which could extend into later life. During the winter, people spend up to 90% of their time inside, where the air is typically much more polluted than outdoors. High levels of pollutants and allergens can cause or exacerbate seasonal illness and asthma. Asthma affects 25% of New Zealand children; the United States Environmental Protection Agency considers indoor air pollution to be among the top five environmental risks to public health. A Massey University construction professor was recognised at the 2016 New Zealand Institute of Building Awards for her work on a solar heating project in New Zealand schools.